The art in this book was created by Nathan using the computer, while he was between the ages of 5 and 8. 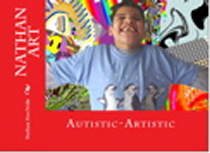 Nathan has ASD (Autistic Spectrum Disorder) - specifically, he has been diagnosed as having PDD, Pervasive Developmental Disorder, in the autistic spectrum. During the years when he was making these remarkable creations and the 120 other amazing pictures we have been able to retrieve from the computer, Nathan spoke very little. He struggles to say just a few words, often having a hard time remembering words. He uses sign language to help him communicate, both to prompt his speech and to convey his needs. Although Nathan hasn't been able to tell us what is going on inside his mind, he has created many fantastic pictures using the computer. These are just a few.